TRI-COUNTY AREA--The first day of school for Yates County school districts will be next week, Tuesday, Sept. 4, following Labor Day. The first day of school for schools in Schuyler and Steuben Counties will be Wednesday, Sept. 5. Dundee Central School District and Penn Yan Central School District will have its first day on Tuesday, Sept. 4 for all elementary, junior high and senior high students. 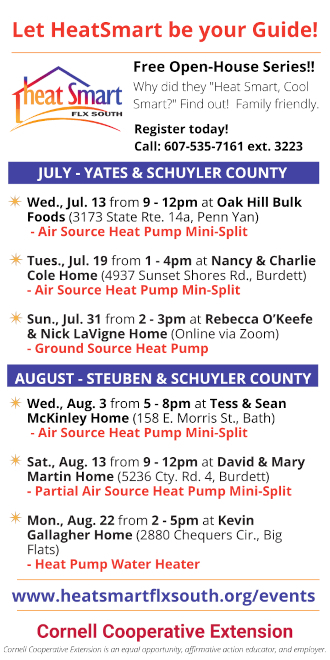 These include Dundee elementary school, Dundee junior-senior high school, Penn Yan Academy, Penn Yan middle school and Penn Yan elementary school. Hammondsport Central School District, Watkins Glen Central School District and Odessa-Montour Central School District will have their first day of school Wednesday, Sept. 5. These schools include Glenn H. Curtiss elementary school, Hammondsport junior-senior high school, Watkins Glen elementary school, Watkins Glen high school, B.C. Cate elementary school, Howard Hanlon elementary school and Odessa-Montour junior-senior high school.